1 Alki / Fort Lawton Fort Lawton - Gilman Av. - 15th Av. W - Elliott Av. W - 1st Av. - Spokane St. - Harbor Av. - Alki Av. - 63rd Av. SW - Beach Dr. & Orleans St.
7 Kinnear Park Jackson St. - 1st Av. - Queen Anne Av. - Olympic Pl. - 10th Av. W - W Wheeler St.
9 19th Av. & 26th S S Judkins St. - 26th Av. S - Jackson St. - 3rd Av. - Pike St. - E Madison St. - 19th Av. N - E Galer St.
11 E Cherry 3rd Av. & Union St. - Pike St. - Broadway - E Jefferson St. - E Cherry St. - 34th Av. - Union St.
12 E Madison - Jefferson Park Madison Park - E Madison St. - Pike St. - 3rd Av. - Jackson St. - Beacon Av. - S Graham St.
13 Summit Ave. Belleview Ct. - Belleview Av. [back: Summit Av.] - Pine St. - 2nd Av. - Jackson St.
17 Cowen Park - 15th Av. NE 4th Av. & Main St. - 3rd Av. - Union St. - 8th Av. - Howell St. - Eastlake Av. - University of Washington - University Way - 15th Av. NE - E 80th St.
21 Phinney Jackson St. - 2nd Av. - Pine St. - Westlake Av. - Fremont Br. - Fremont Av. - Phinney Av. (Woodland Park Zoo) - Greenwood Av. - 85th St.
22 Meridian Jackson St. - 2nd Av. - Pine St. - Westlake Av. - Fremont Br. - N 34th St. - Wallingford Av. - N 45th St. - Meridian Av. - E 56th St. - Latona Av. - NE 56th St.
26 W Queen Anne S King St. - 1st Av. - Queen Anne Av. - Galer St. - 6th Av. W - W McGraw St.
27 15th Av. NW Yesler Way. - 1st Av. - Elliott Av. W - 15th Av. W - 15th Av. NW - 85th St.
28 Ballard - 20th NW Yesler Way. - 1st Av. - Cedar St. - 5th Av. N - Broad St. - Dexter Av. - Nickerson St. - 15th Av. W - Ballard Way - 24th Av. NW - W 67th St. - 28th Av. NW - 32nd Av. W & 85th St.
FS Front Street S King St. - 1st Ave. - Queen Anne Av. - Highland Dr.
MS Madison Street Waterfront - Madison St. - 14th Av. 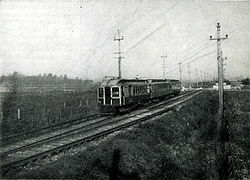 NB: The two-letter route designations above are for the convenience of readers, and were not used by the operator. 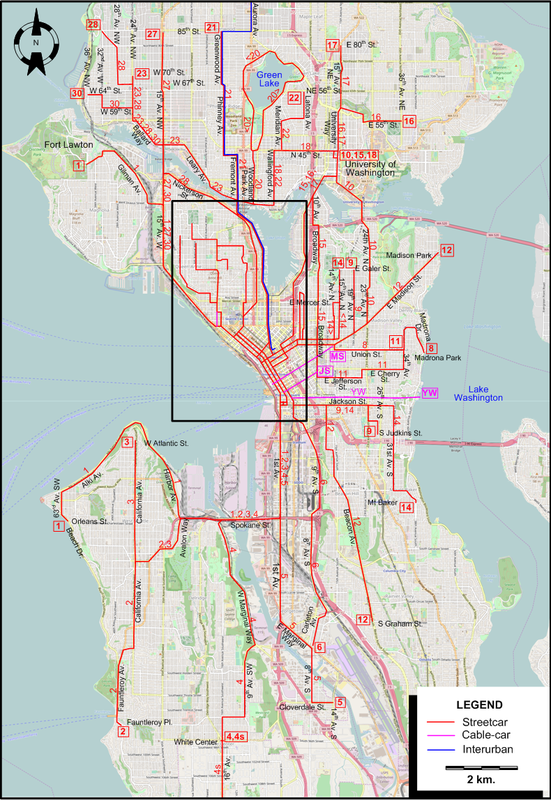 Seattle cable cars: ? km. Light rail / Streetcars (1st & 2nd generation) / Tourist streetcar: 1435 mm. Blanchard, L. The Street Railway Era in Seattle: A Chronicle of Six Decades Forty Fort (PA): Harold E. Cox, 1968. Price, J.H. "Museum News [Seattle]", Modern Tramway & Light Rail Transit, Jan. 1982 (45:529), p.30-31. 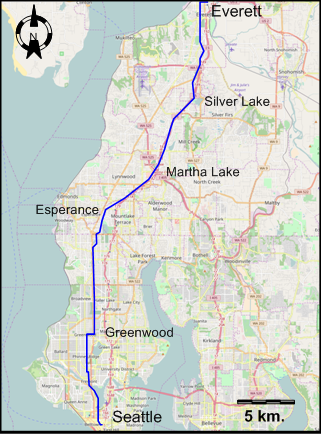 Simons, V. "Seattle: Cutting edge LRT solutions", Tramways & Urban Transit, Jan. 2016 (79:937), p.9-13. Taplin, M.R. 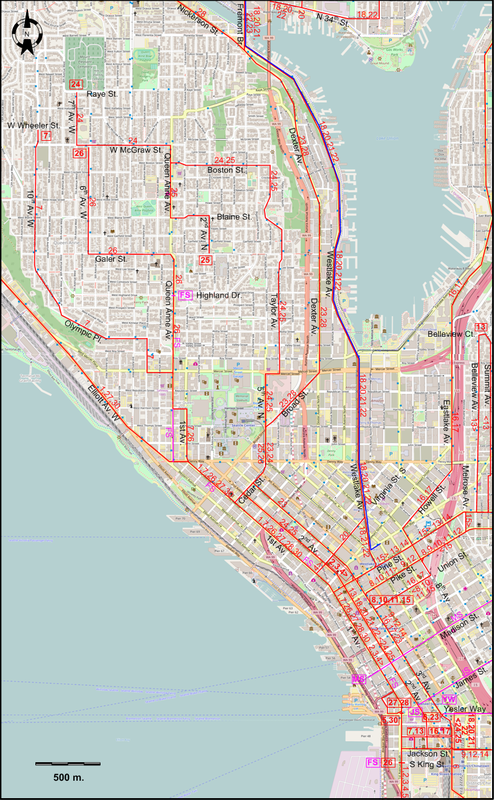 "Miraculous in Seattle", Tramways & Urban Transit, Oct. 2009 (72:862), p.380-381. 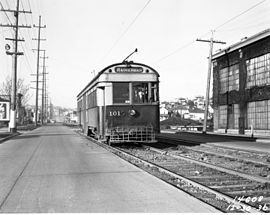 More than 100 years ago, streetcars ran throughout Seattle. Here’s how they met their demise. With my special thanks to the staff in the Seattle Collection division of the Seattle Public Library for their kind help while I was doing research for the preparation of this web page.